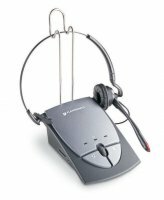 Plantronics S12 Telephone Headset System offers convenience and comfort. Includes a 2-in-1 convertible headset for over-the-head stability or over-the-ear convenience, a noise-canceling microphone for superior sound clarity and the Firefly in-use indicator light that lets others know you are on the phone. Headset stand also included for easy storage when not in use. Operates on AC power (included). Amplifier features mute and volume control. Connects to most single-and multi-line corded telephones. For the small office and home office, the Plantronics S12 is stylishly designed for easy use with a choice of headset wearing styles. The headset can be worn over the head for stability or over the ear for convenience. The headset also features Firefly, the in-use indicator light that lets others know you’re on the phone. * Hands Free - Improve your productivity—filing, using e-mail, taking notes while on the phone. Keep your hands free to multitask. * Noise-Canceling Microphone - Delivers crystal clear voice quality and eliminates annoying background noise. Enjoy the whole conversation. * Call Clarity™ Technology - Filters phone line and room noise for clearer calls. * Firefly™ In-Use Indicator Light - No more unintended interruptions, thanks to this unique boom-mounted flashing red light that lets others know you’re on the phone. * 2-in-1 Convertible Headset - All-day comfort with the style that works best for you: over the head for stability or over the ear for convenience. * Easy Installation Connects to single- or multi-line phones.